DAMN!!!! DAMN DAMN DAMN! 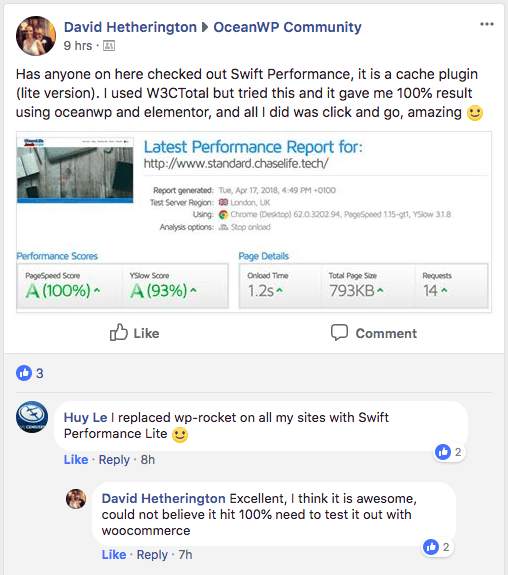 I feel embarrassed to say this but gotta give credit where it’s due: SWIFT PERFORMANCE LITE PLUGIN is the motherf**ken magic wand of the WordPress speed-up universe! 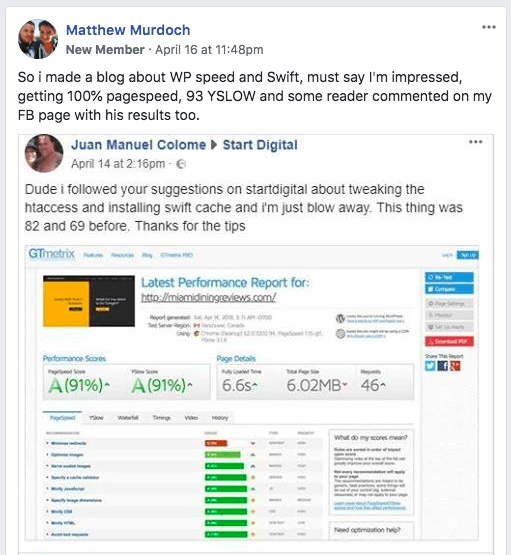 I’m embarrassed because I’ve made it my personal mission to stay on the cutting edge of WordPress speed-related optimizations/development and for whatever reason have not yet gotten around to this one. I’ve been talking up other plugins while not fully aware of this monster lurking in the shadows. basically, I’ve tried a ton already. All the big names and even many of the smaller names. If you really really have to know (W3TC, Super Cache, Fastest Cache, Hyper Cache, Simple Cache, Comet Cache, FOCUS Cache, etc.) and also a million other non-cache related plugins that minify/combine/concatenate/defer/re-organize asset delivery. 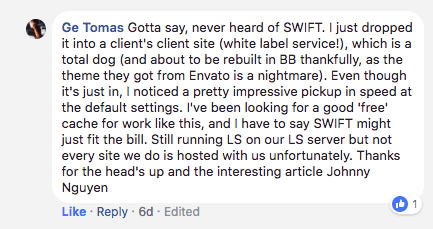 I initially installed Swift Performance Lite on my shared hosting server and then stopped setting it up because it wanted my email address (to spam me, of course!). 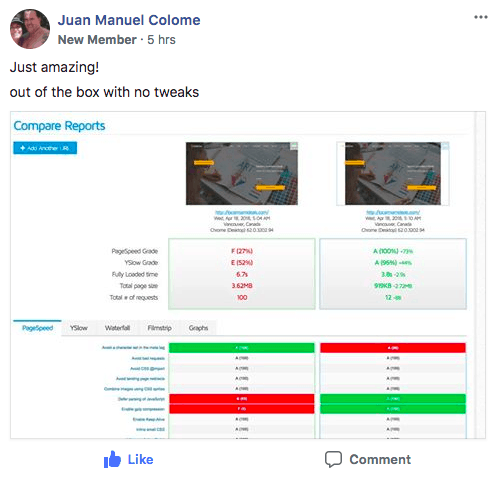 I made a complaint on a FB group and the owner (god bless him) assured me the emails were few and far between and that the free plugin was definitely worth giving up my email. Anyway, staying true to my personal mission I gave it a shot this morning and just have to say how blown away I am. I tried it on a SiteGround server and it beats the crap out of the silly SG Optimizer. In case you’re wondering, it took about 2 minutes to set up. We’re talking DNS-level speed using only code/server-level resources. On first impression without having to tune anything, it blows away what I could manage with other plugins requiring such precise tuning. 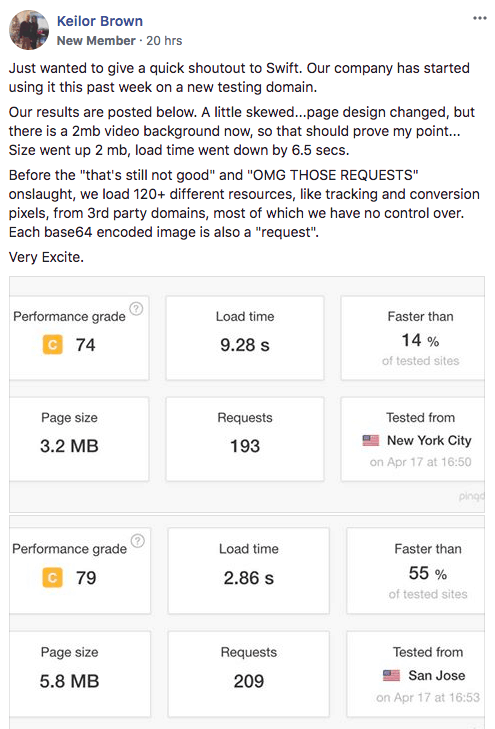 Website with SiteGround’s inhouse SG Optimizer plugin: a little faster than without. 200ms difference in pingdom tests but to the eye, you wonder if there was any improvement. 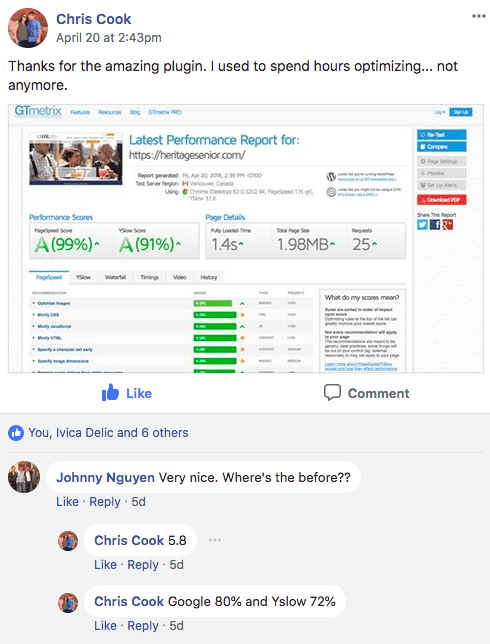 The annoying thing is that the page loads are still a little “sticky” so it feels like it slows down before it speeds up…if you get what I mean. 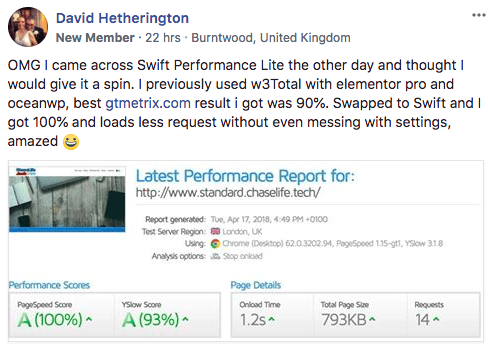 Website with MAGICAL WAND “Swift Performance Lite”: it was so damn fast, I started laughing. We’re talking instantaneous. Like every f**ken click was instant like my site was loading locally. On a WooCommerce store, the styles broke. All I did was disable the JS-related features and it was perfect again, and also so shockingly fast. For anyone else having issues, make sure you disable “Merge Scripts” and “Merge Styles” if something is breaking on your site. Another thing is that it doesn’t seem to decrease your test scores. 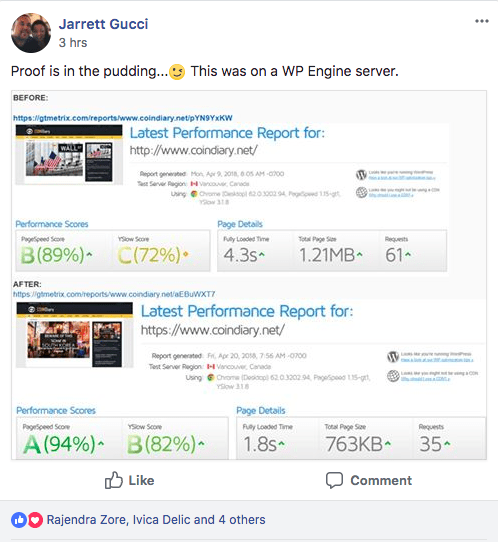 So while it feels blazing fast to the eye, your pingdom scores might stay the same or even be a little higher compared to other cache plugins. Anyway guys, give it a try. Take it from me, I’ve tried everything. This thing is the real deal and worth giving away your email, address, phone number, social security, bank account. This thing will get you a speed ticket in space. It should be a crime to load this fast! 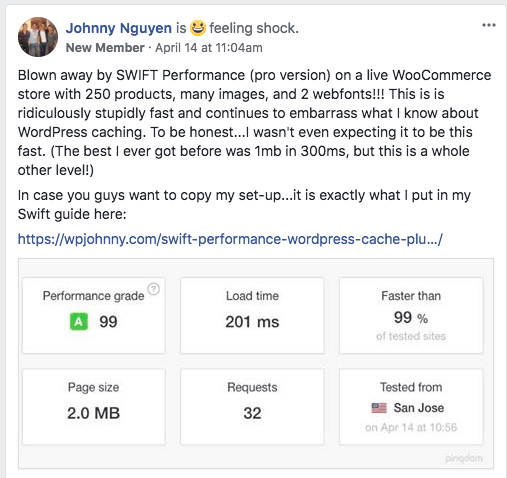 Swift Performance WordPress Cache Plugin – UNOFFICIAL GUIDE – copy my default configuration for Swift. Best WordPress Cache Plugins Review – my exhaustive cache plugin comparison guide. Over 40 cache plugins reviewed! Lots of community growth and rapid development! Awesome, Anjum! So glad this helped you. 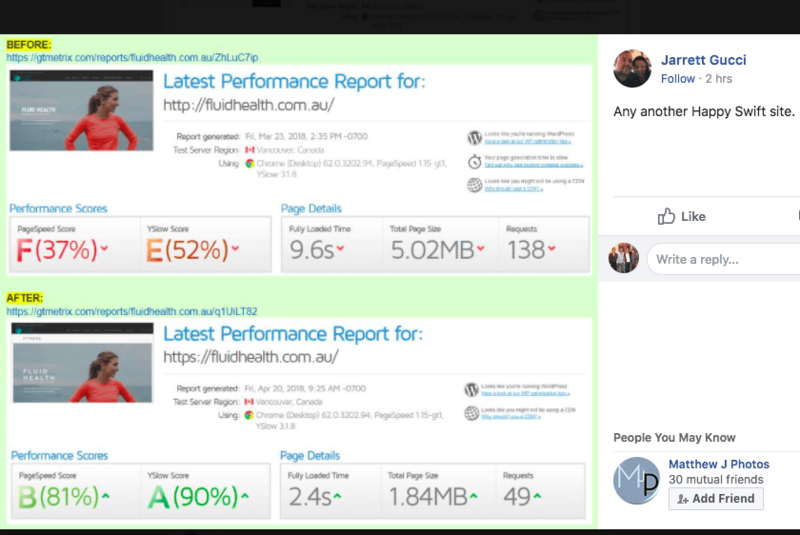 Hey Johnny, firstly – brilliant, excellent & informative site – thanks heaps. Quick question re SiteGround. I’ve been using their caching plugin & WP Rocket (as they apparently work well together). 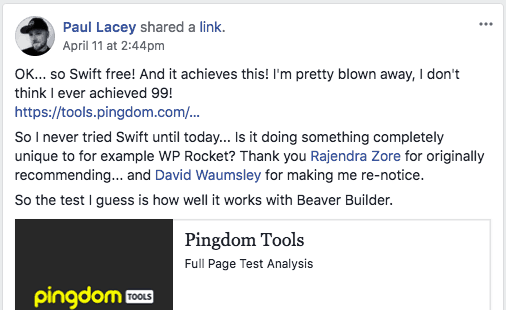 Would your recommendation be to just use Swift instead of SG Optimizer & WP Rocket? Do I not need to use their plugin (SiteGround’s) to take advantage of their dynamic cache etc (in cPanel)? 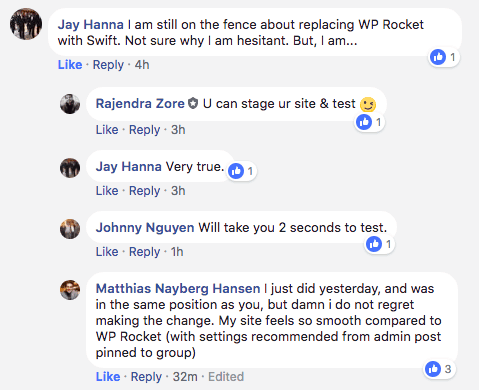 I’m running a Cloud VPS, & have tried swapping SG/Rocket for Swift on one site & definitely have registered an improvement, but I just want to make sure that just using Swift will still take advantage of SiteGround’s set up. I’m pretty sure that’s the case, but I’m no expert so would love to hear your professional opinion. I highly recommend Swift Lite (yes, the free one) over SG/Rocket on even SiteGround servers. If it’s performing faster for you, then it’s definitely “taking advantage of their set up”. I can look at the site if you’d like as well. I used Swift Performance Lite and went to their paid version after an already great score (got 100/100 now). 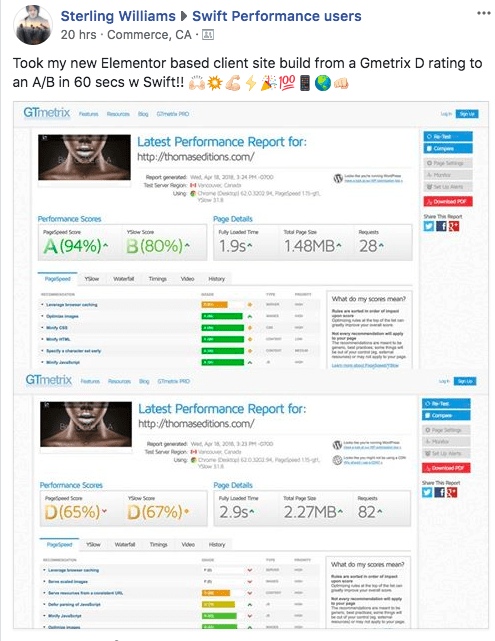 Swift Performance plugin outperforms WP Rocket on every level. Worth to mention: The paid version intergrates and optimizes Google Analytics and has a really good image optimizer build in. Making different/seperate plugins for this absolete. After all the less plugins the better. This plugin deserves so much more installations. 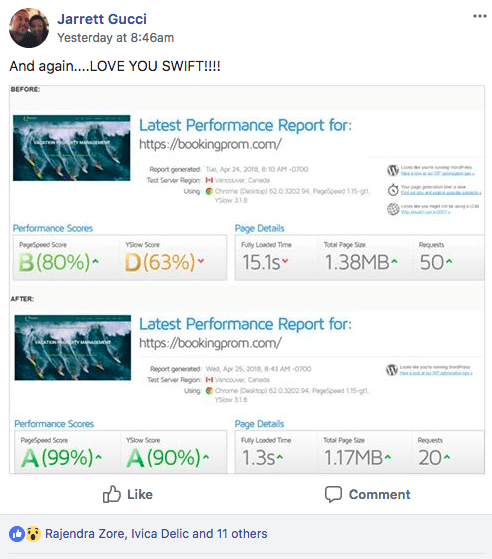 According to me Swift Performance is the new standard. Finally! Spread the word! I’m right with you, Frank. It’s incredible Swift isn’t more popular. Granted, it’s still a bit less user-friendly than some of the established plugins on the market but they are definitely the fastest (top 2) for me and yes, better than WP Rocket. I can’t wait to see their new UI redesign in the works. Oh really. Do they have a new design upcoming? How do you know? I’d like to get more info on that. 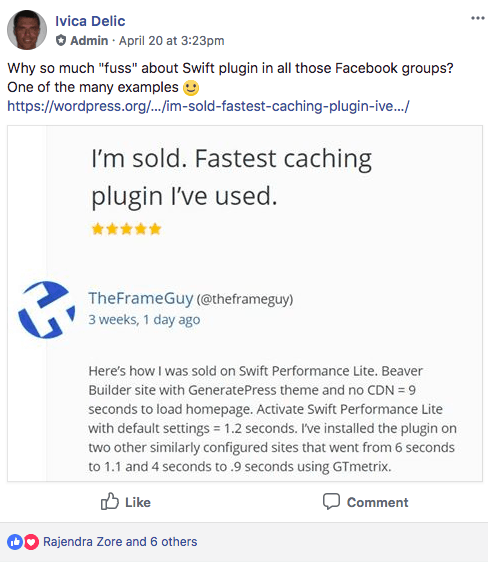 FB group and other blogger suggested this plugin, I tried many times, but it breaks the theme often, tried disabling scripts, style, Cloudflare, but no way. So uninstalled. I reckon I can fix the issue if you can get me admin access. 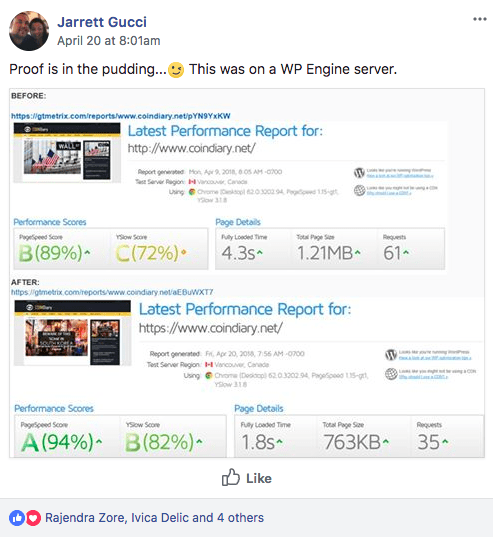 I have a LiteSpeed web server and I do use LiteSpeedCache WordPress pluginand it’s very very fast. 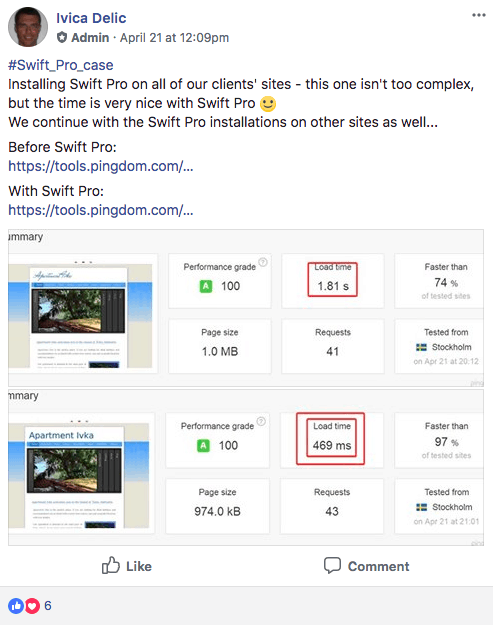 Is Swift Performance Lite better? I’m French and I do not understaf what you call the “stickiness”? The “stickiness” is what I refer to when it seems like the page is frozen for a split-second and then loads everything instantly. Yes, LiteSpeed cache is beautifully fast. I highly recommend it if you have tons of traffic or more than 3k pages. Just noticed that Swift Performance Lite is caching all emails sent via SMTP Post plugin. I don’t see a way to exclude it. Really odd. Have you tried excluding them in the post types?